Western Pennsylvania trails offer stunning views of wildlife, vistas, waterfalls, old growth forests, and wetlands. Options range from short loops to challenging, multi-day treks through state forestlands. Some trails offer scenic, leisurely hikes, while others may require a rigorous effort. It’s no wonder hiking is one of the most popular outdoor activities in Pennsylvania—there is something for just about everyone! If you plan to do a good deal of hiking or go on extended hikes, you might consider taking a wilderness first aid class, such as the one offered by the American Red Cross. Such a class can be helpful for beginners and seasoned hiker. Before you start your next adventure in the great outdoors, make sure you tell your friends and family about your plans (in case of an emergency) and pack the following essentials. Appropriate footwear. You should have either hiking shoes (for shorter distances) or hiking boots (for longer distances). A map or compass. Regardless of the type of trail you plan to hike, you should look at a trail map and plan your route. Many state parks have maps at the visitor or welcome center. You can also can print one from the internet. If you plan to take a longer hike in a remote area, having a compass may help you stay or get back on track. Use a broad-spectrum sunscreen with a sun protection factor (SPF) of at least 30. Reapply it every two hours, even on cloudy days. If you sweat heavily, apply it more often. Insect repellent. You may encounter mosquitos, bees and wasps, ticks, and others insects during your hike. To protect your skin, you should apply and pack insect repellent. The amount of water you need depends on how long you plan to hike. According to the National Park Service, you should drink half a liter to a full liter of water each hour. This will help you stay hydrated. (One liter is about two 16.9-ounce water bottles.) Remember to drink before you get thirsty. It’s easy to underestimate the amount of food you need for a hike. If you plan to hike around the time you’d have a meal, you should pack that meal and some snacks. Easy-to-digest foods work best (trail mix, nuts, granola bars). Sunglasses and a hat. Pack or wear wraparound sunglasses that will protect your eyes from UVA and UVB radiation. Wearing a hat and sunglasses will protect your eyes, eyelids, ears, forehead, and the surrounding areas. A first aid kit. You can purchase a prepackaged first aid kit and use it to treat scratches, blisters, or any injuries from a fall. Your medications (if applicable). If you take any maintenance medications, you should pack them in case you’re out longer than expected. If you or someone you’re hiking with has an allergy, you should carry an EpiPen. Safety items. Hiking safety experts recommend taking materials to start a fire (for both warmth and to signal in case of an emergency). At a minimum, you should have matches and fire starters. You should also carry a whistle to signal for help and an illumination tool—such as a lantern or a headlamp—to light heavily shaded areas or to use at night. A knife or a multipurpose tool. With one of these tools, you can fix broken glasses or cut cloth into a bandage during an emergency. Rain gear/extra clothing. If you plan to take a multiday hike, you should pack and wear layers of clothing. Doing so will allow you to add or remove items as the weather changes. Remember to wear moisture-wicking clothing—cotton will keep moisture close to your skin. A form of emergency shelter. This can protect you from the elements. The National Park Service recommends carrying a tent or a tarp, as well as an emergency space blanket. The best way to guarantee a good time in the great outdoors is to be prepared. 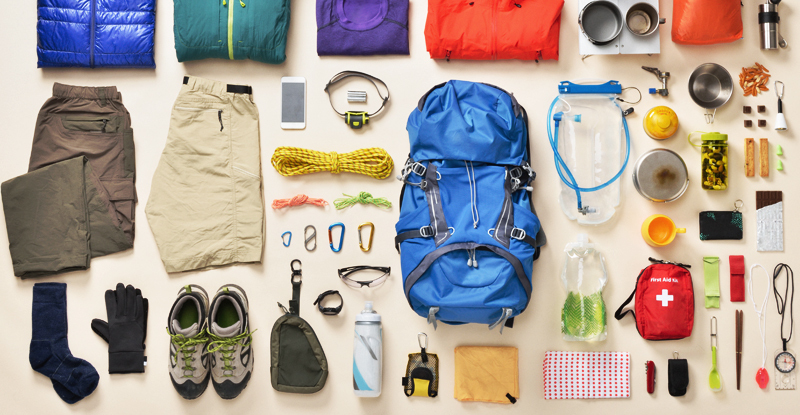 By packing the essentials, you can be ready for whatever Mother Nature sends your way.